Imagine my surprise, while perusing the September 2013 edition of “The Garden” magazine, that I happened upon a mention of my old home town. Now it’s not a big place – sleepy almost! Nor was I aware of anything of horticultural significance, having happened there. Admittedly, this may have been due to my childhood lack of interest in that field. But now it was of great interest to me! 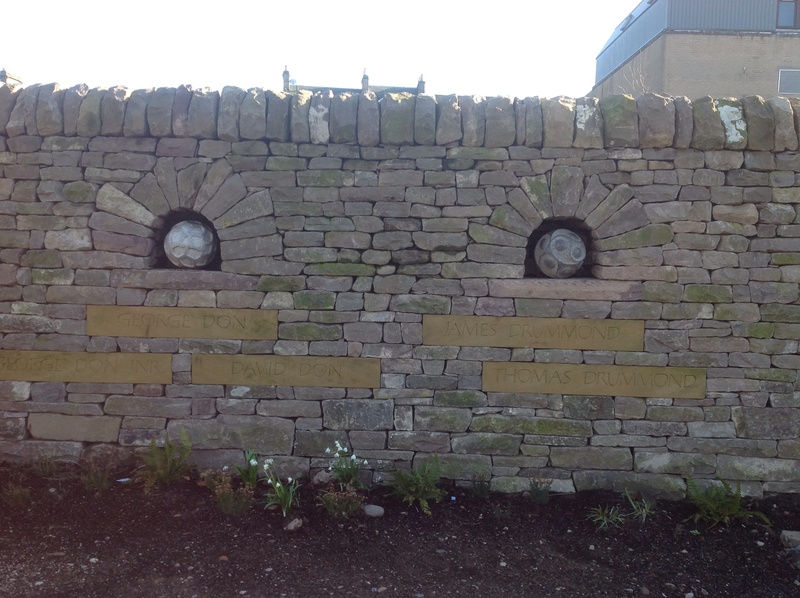 A new garden was being created on an old patch of land by the Myre – an area of common ground used as football pitches – to commemorate five famous botanists from the town. Between them, they collected plant samples, many new to science, from around the world. They described and catalogued many plants from their own or from other collections, with many plants being named in their honour. George Don Snr. explored mainly the local areas of Angus and its hills and glens. A moss, Grimmia donniana, was named in his honour, as was the forget-me-not, Myosotis alpina Don. Although he created his own nursery, it appears he wasn’t much of a business man and he died in poverty. Two of his sons, George Jnr. and David, carried on after his death, although, not literally, following in his footsteps. George travelled through West Africa and South America, while David’s expertise lay in the Himalayas. George returned with orchids and other exotics – Oncidium donianum is named after him – but also introduced types of alliums, witch hazel and Kalmia latifolium. David, however, was not so much a collector, but more of a cataloguer. He had many works published and was librarian of the Linnean Society. And Euphorbia donii bears his name. James Drummond spent much of his life living and working in Western Australia. Not only has he more than 60 plant species named after him, including Banksia drummondii, he also has a mountain, Mount Drummond, named in his honour. His brother, Thomas, had many travels in North America, his first as a naturalist on the expedition to find the North West passage, and later in the southern states. He had over 80 species named after him, including, probably, most famously, Phlox drummondii, bearing his name, along with an Acer rubrum and an Anemone. 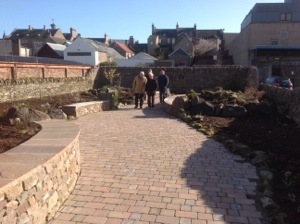 The memorial garden was to convey the local landscapes of the Angus countryside that inspired them, along with plants that they introduced or had named in their honour, as well as plants local to the glens. As trees featured in many of their introductions, but were unable to be located in the garden, a second area, by Forfar loch, was also to be planted in their memory, just a stone’s throw from the garden. Naturally, this I had to see on my next trip home! So, earlier this month, when we went back, I went armed with camera, as well as I-pad, intent on a blog post! As you can see, it’s not a large garden. It’s beautifully laid out, with raised beds incorporating seating benches. The wall you can see on the left, is a relic from old Forfar, while the other undulating, dry stone wall, has been newly built to recreate the surrounding, undulating Angus hills. It is obviously a brand new garden, still in need of filling out (it was only completed Sept 2013) and this is its first year. And at this time of year it was only starting to come to life. There were still plenty of little gems to see, though! At the end of the garden, in the south wall, two spheres have been carved out to represent each family – a spore to signify the Don family, and a seed head for the Drummonds. A nice, unusual touch! It was a lovely little garden, and a lovely spot to sit and ponder, though the weather would have to improve dramatically before that would be possible! That day was windy, and bitterly cold. A “wrap up warm” day! However, despite the distances involved, I will be lucky enough to be able to revisit it and see how it matures. There is so much more to come – I’ve seen the plant list! I’ll make it summer next time! 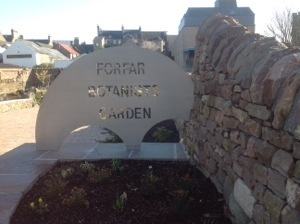 This entry was posted in Gardens and tagged Angus, botanists, Forfar, Memorial garden, plants on March 26, 2014 by thelonggardenpath. A couple of my scented shrubs have been giving me great pleasure over the last month or so – definitely scented gems! 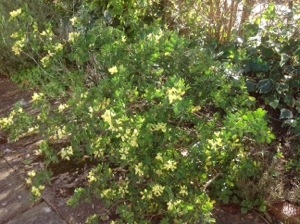 My Coronilla glauca “Citrina” seems to have been flowering for ages! It started slowly, at the start of the year, and is now smothered in beautiful, lemon, pea-shaped flowers. They emit a lovely, fruity scent, that some people liken to peaches. I can detect fruit, but more vanilla. The whole plant is a thing of beauty, with glaucous blue leaves, that I can only describe as being like Ruta graveolens, the herb Rue, but without the scent. It is reputed to be slightly tender and is recommended to be grown against a wall for protection. Mine is freestanding, in our front garden, which is south facing and so is in full sun, which combined with our sandy, free-draining soil, seems to suit it so far – touch wood! It has quite a lax habit (maybe wall training would be the thing to do!) and so far, has not seemed to need pruning. I’ve just left it to do its own thing! It apparently can also be grown in pots – ideal for winter protection. I bought my specimen a couple of years ago at the Malvern spring show – possibly my favourite show! It had been picked out on the “Gardener’s World” coverage of the show the previous night, so I just had to find it. And I’m so glad I did! Daphne laureola is doing really well now, since I extracated it from the overreaching branches of its neighbouring Lonicera fragrantissima, when that was cut back a year or so ago. By contrast, it seems quite an understated shrub. 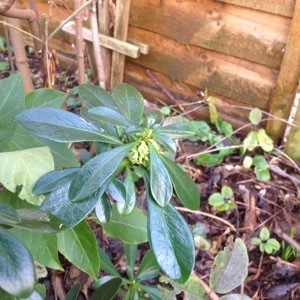 Similar to my other winter favourite, the Sarcococca, it is a low growing, evergreen shrub with small, insignificant looking flowers. What sets it apart though, like the Sarcoccoca, is its magnificent scent – sweet and vanilla. And the clusters of small flowers, which nestle under the whorls of shiny, green leaves, are such an unusual, lime green colour – a subtle gem! I must also include my Abeliophyllum distichum, although its flowering was short lived. It is also known as the “White forsythia”. Definitely much more subtle than its namesake, it has a similar habit, but the flowers are so much more delicate – white, flushed with pink – and scented to boot! Like Forsythia, the flowers appear on bare stems, before the leaves appear. It is best, grown supported, against a wall. Mine is growing in a large pot, supported with canes, in a sunny position. And again, minimum maintenance! And after walking “round the estate”, I can see so many more gems just waiting to burst forth! What an exciting time of year! This entry was posted in The Scented Path and tagged Abeliophyllum, Coronilla, Daphne, Scented shrubs on March 22, 2014 by thelonggardenpath. I’m ashamed to say, that the contenders for February are a bit thin on the ground. I did keep it going, but there was a large element of repetition. I could blame a lack of cutting material, but it’s more likely to be my lack of imagination. “Six of the best” was interesting – a sort of botanical “exercise”! – but some elements of the composition did not last well. It comprised of a single sprig of six winter-flowering shrubs, in each of my milk bottles. 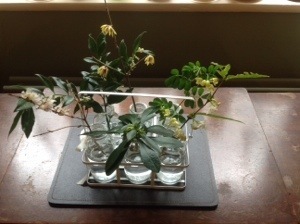 Abeliophyllum distichum, Daphne laureola, Chimonanthus praecox, Coronilla “Citrina” and of course, Sarcococca and Lonicera fragrantissima. The smell was wonderful! I loved the single sprig of Chimonanthus! I felt it was “understated chic”(!) – Japanese almost! It was simple and long-lasting, as well as fulfilling the original aim of bringing the scent down to nose height. 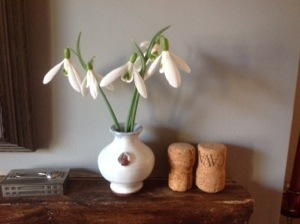 But the simple beauty of the snowdrops, was the winner. So lovely, to bring the harbinger of spring indoors and be able to appreciate them at eye level. 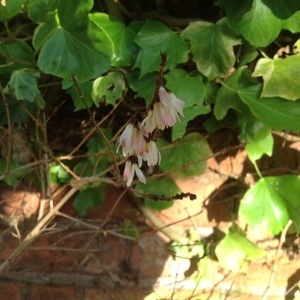 This entry was posted in The Cuttings Calender and tagged Abeliophyllum, Chimonanthus, Coronilla, Cuttings, Daphne, Lonicera, Milk bottles, sarcococca, scent, snowdrops on March 17, 2014 by thelonggardenpath. ….I, sadly, managed to resist all the beautiful hellebores – the yellows, reds, and doubles…..(sob!). Instead, I was disciplined enough to stick to what I needed – some holly hedging to plug a gap in my native hedge. I did add in some sweet pea seeds, though, with a view to have some lovely cutting flowers, to adorn both the potager, and the house. I chose two old varieties – “Matucana” and “Painted Lady”. Let’s see what happens! And there’s always next month’s visit! This entry was posted in I went to Ashwood and... and tagged Cutting flowers, holly hedging, sweet peas on March 16, 2014 by thelonggardenpath. Spring sunshine and promises of things to come. It’s amazing what a bit of warm, sunshine can do, not just to our spirits but also to the garden! I was walking round “The Estate” yesterday, and suddenly, all had become “spring-like”. 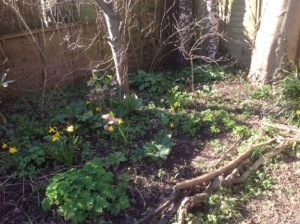 The crocuses and daffs from the last few weeks were being overtaken by so many other new buds and flowers. Signs of life and promise were bursting forth everywhere. The crocuses we planted first, are really spreading out now and creating impact. However, are now starting to look past their best for this year. The forsythia, which we inherited when we moved in, has stayed even although it doesn’t “fit” my scented border theme, purely because I didn’t fancy trying to dig it out! Instead, I’m keeping it well pruned to keep it from dominating, and using it as a host for a scented climber. I’m trying to establish a Clematis rehderiana through it. This one has pretty, lemon bell-shaped flowers, with a scent of cowslips. 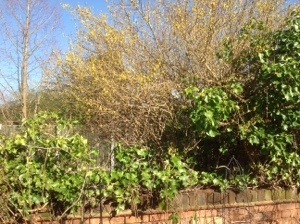 But the forsythia’s cheeriness does earn it it’s keep, at this time of year! Here it is, starting to do its thing. 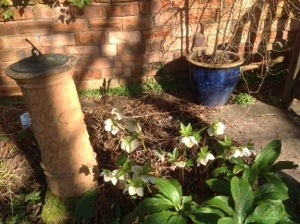 These new shoots of another scented clematis, this time Clematis flammula, definitely show the promise of things to come! This, despite being cut back hard in Feb, will smother its arch by the end of summer. Its shower of white starry flowers, billow forth providing a spectacular display. And yet the scent is quite delicate – a soft, almond scent. 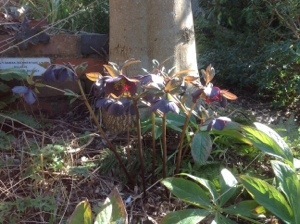 Two of my Ashwood hybrid hellebores are going great guns at the moment. These are in my two small “black & white” beds. You can’t tell here, as is the nature of hellebores, but the white ones have wonderful purple/black speckling inside the flowers. And my beautiful Cherry! I love it’s quirky stems, and delicate, soft pink flowers. 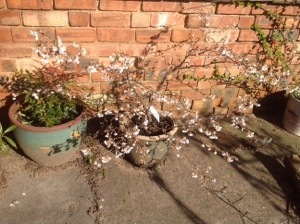 I was determined to have some Cherry blossom in my garden – no scent granted, but another lovely, harbinger of spring. As I was running out of border space, I opted for a dwarf variety to grow in a pot. What a choice – it’s been a thing of beauty ever since. This year I’m planning to treat it to a new, bigger pot! These unnamed primulas and dwarf narcissi, are remnants of a previous Mother’s Day present – a potted plant display that my son bought me two years ago. Once the display went over, I planted them out. And haven’t they done well! They sit nicely at the end of “The long garden path”, nestled around our statue in the “woodland” area. 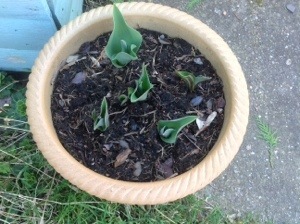 My tulip shoots are coming through too. 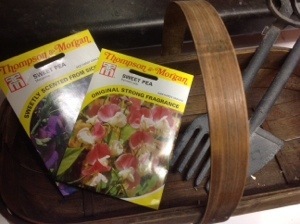 I wanted to grow some in a spare pot I had and fell in love with a recommendation of Sarah Raven’s – “La Belle Époque”. It’s described as a double tulip, mainly pink, with coffee colouring at the base of the petals and with flashes of crimson and green. The picture looks nicer than the description sounds – trust me! I’m looking forward to seeing it flower. And to round it all off, a shot of our “Woodland” garden, which I revamped last autumn, by adding some more shrubs for autumn interest at the expense of some poorly performing perennials. It’s coming on! This entry was posted in Uncategorized and tagged clematis, crocuses, forsythia, Hellebores, narcissi, primulas, Spring, tulips on March 14, 2014 by thelonggardenpath. My trip to Murrayfield for the 6 nations rugby fixture, has opened my eyes, and ears, to a fantastic new style of music to me, but well known to Scottish rugby fans as “The Red Hot Chilli Pipers”. A pipe band with a difference. Bagpipes, obviously, in conjunction with guitars, keyboards, and drums. They were formed in 2002 and manage to merge traditional Scottish pipeband music with modern pop and rock classics. Forget “Mull of Kintyre”! 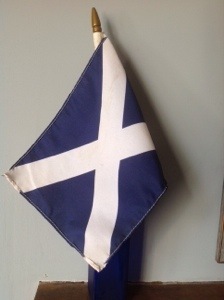 Think more “Flower of Scotland” meets The Who. Or Gary Newman mixed with “Auld Lang Syne”. I admit, it may not be everyone’s cup of tea (or nip of whisky!) but I’m definitely a fan now. What better way to inspire a Scottish rugby crowd – or any Scotsman! It’s so stirring! If you are a music fan and fancy something a bit different, it’s worth a listen! This entry was posted in Uncategorized and tagged Bagpipes, music, Scotland on March 11, 2014 by thelonggardenpath. My copy has just dropped through the door! I’ve been waiting very patiently! At the first flick through, it looks great – wonderful piccies, plans too. 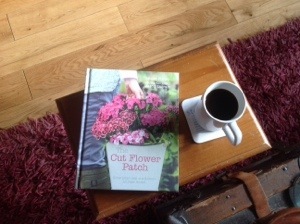 As you can see, the coffee has been made, and is waiting for me, so I’m off to peruse my new book more thoroughly. Bye for now! This entry was posted in Uncategorized and tagged books, cut flowers on March 3, 2014 by thelonggardenpath.